You will not be recognized by your close ones, friends and enemies. Is it delicious? Perhaps, on the contrary, it is exciting and unpredictable. 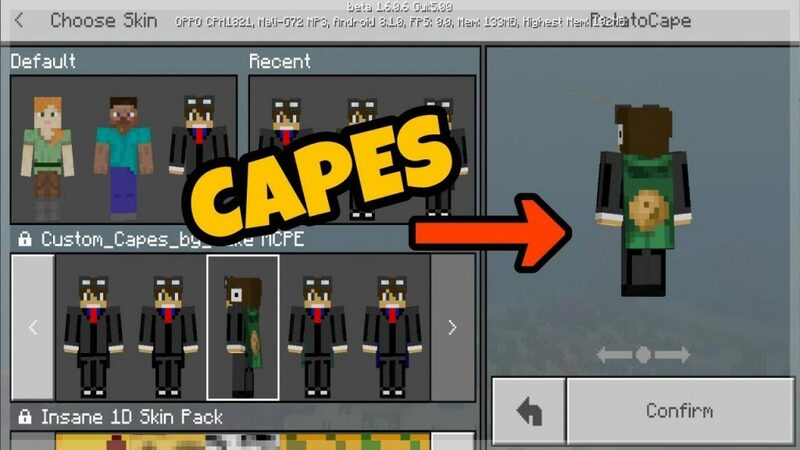 And the best thing is to download a skin with a voluminous cloak for Minecraft PE 1.2.0 on your favorite server. Among the other players, you will learn everything that before did not have enough time. In addition, if before raincoats in Minecraft PE were mostly flat, now you can make a three-dimensional version. The author of this skin has not spent much time developing it, but the effect will surprise even those who seemingly got used to everything that happens on the planes of Minecraft Pocket Edition. What makes a skin with a large cloak special? This cloak skin will not develop in the wind or in general as anything to move, but it can be edited. To make a raincoat of this design as you want, you need to download the .mcpack file to your computer, open it with any archiver, for example Winrar, and then find there the cape.png file – you can open this file with any graphics editor and decorate it, and then replace it the original version in the archive. Skin with a voluminous cloak for Minecraft PE 1.2.0 is suitable for any krafter, no matter where he plays, which cards he prefers to study primarily and a host of other nuances. Everyone has the right to choose what suits him.